Professional Cleaning & Polishing to the Highest Standard. Since 2003. We would love to thank very much all our clients for all their nice comments, warm welcomes and teas. We welcome any of your feedback. We are delighted with the hall and we are so pleased that you could do it in time for the party! I have already given your name to one of my neighbours who was interested. Really happy with the floor and the service in general! 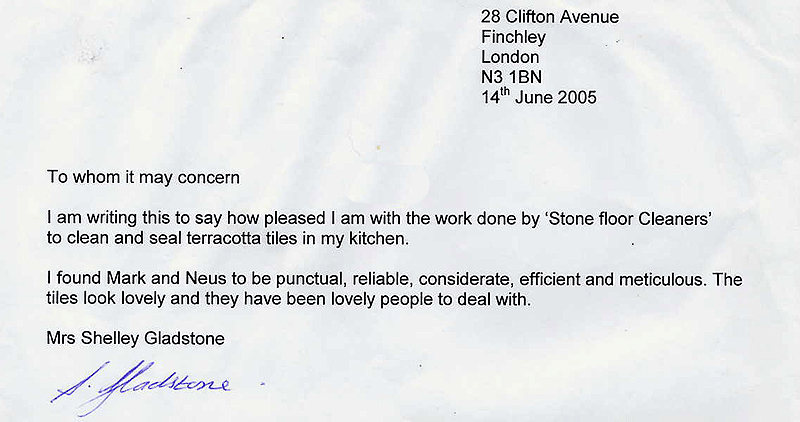 We feel lucky to have chosen Marc to restore our two bathroom limestone floors. I had sought three quotes, and selected Marc after he had visited in person to survey and quote. I could see that he had an eye for detail, a deep knowledge of stone and could explain what a realistic renovation would achieve. We could not have been happier. .. Thanks again for all of your hard work and the floors look fabulous. Have a great Christmas and New Year. Just thought I ought to say a few words about the two young men who did the job (sorry forgot their names); they were extremely pleasant, helpful and professional. A great reflection on the SFC company. May I take this opportunity to thank you for a great job. The young man in charge of the operation was very nice and very competent. I just wanted to say your team did an excellent job on the balcony cleaning and we're so happy with the results! I hoping maybe in the new year we can revisit looking at getting the marble cleaned in our bathrooms. Thanks again!! Thank you for making the floors look so beautiful. They are transformed beyond my any possible expectations, and I am deeply grateful. Hi Marc I just wanted to say what a truly wonderful job you and your team did for Dolores. She is just so so pleased especially with the kitchen floor which you did a miracle on. Any opportunity I get to recommend you I will. Your care and dedication is beyond impressive. Wishing you all great health and happiness. Thanks very much for your excellent work. The floor looks better than it did when it was new. thank you so, so much. The floor looks truly magnificent - a true transformation. My wife said your guys and Marc were just brilliant… I just wanted to say a big thank you to your team for all their work and I promise we will get you back after my daughter has trashed the floor again!! Good job. Floor looks amazing. "Hi Chloe, I’m really pleased, they’ve done a great job. I’ve attached a picture. Thanks. Helen"
I’ve popped a cheque in the post to you And thank you so much for an amazing job - you were absolute stars Pleasure doing business with you - and I will recommend you to all my friends in Barnes! Thank you so much for a wonderful job. You are amazing our floor even more amazing now. Best wishes. Many thanks for your wonderful work on the Victorian tiles in our hallway. They have never looked so good. 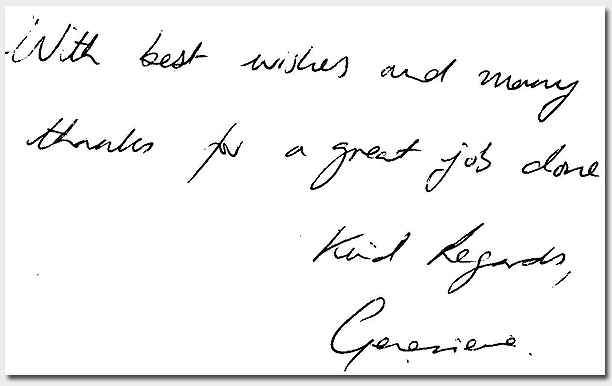 You were incredibly professional with great attention to detail. We are all delighted with the job. Even visitors to the house have been commenting on how great the tiles now look. Would recommend your service with no hesitation. Thanks again. Thank you for the cleaning last week. Thank you for your excellent work and prompt service. We have now had the opportunity to use your company on two occasions, on two different properties, and have been very happy and satisfied. Thank you again! I think we first met you some fifteen years ago and have now been to our house to clean and renovate 4 times. As always the end result is spectacular and is positively commented on by our friends. We readily recommend you. You and your team are a pleasure to have in the house, working speedily with the minimum of fuss. We hope to welcome you again in three years' time! This is the second time we have used your services and again we were very impressed with the work you did and wouldn’t hesitate to recommend your company to others looking for natural stone polishing services. You arrived promptly, were friendly and courteous and completed the work efficiently and timely. You also provided useful advice throughout the day. I found myself looking at our kitchen floor a couple of days later thinking how much of a good job you had done. You made our matt granite work tops look better than when they were first put in. Finally our marble patio is completely transformed. Before you came it looked terrible but now it looks great. Thanks again for doing such a great job. I have always been very pleased with the results of cleaning my stone entrance steps. 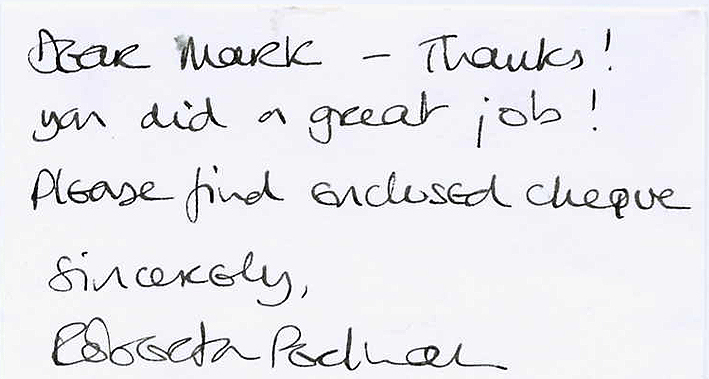 This is the third time I have used your services and your firm is extremely efficient and a joy to deal with. From start to stop and excellent job done on our hall floor and we are thrilled with it - it looks brand new! Lovely people to deal with. Thanks so much. I had my floors cleaned by Marc & Co last year and I was extremely impressed with the quality of service and the outstanding results. I have since recommended the company and will be contacting them again soon with some repeat business. please thank Mark for the wonderful job he did. Thank you very much for improving the appearance of the bathrooms. Your effort is much appreciated. Very friendly and accommodating service with fantastic results. Thanks again for yet another fabulous job! What I love about you guys is that you always do a great job - even on the tough job (our entrance hall) which involves a bit more work than anticipated! You know we'll be in touch in a few years for you to renew our floors again. Thank you for the work The floor looks really good! 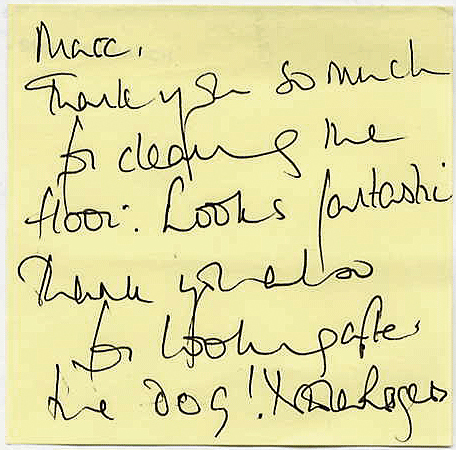 Many thanks – the floor looks great. I have paid your invoice directly this evening. I'd really like to thank you both for the great job you did. 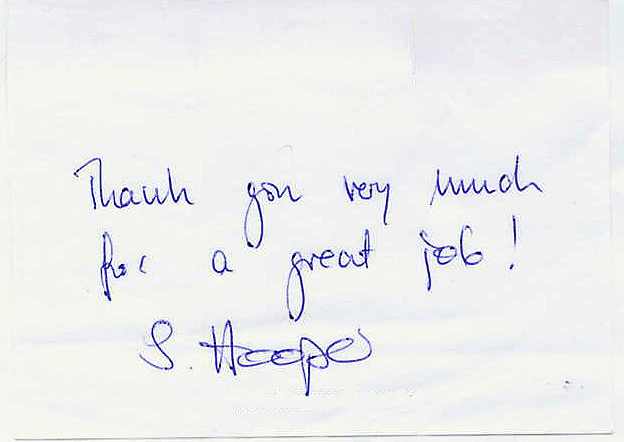 You were lovely to have in the house - really delightful and very professional. The kitchen looks the best it's looked in years. Thanks so much All best wishes. Thank you for cleaning the kitchen floor It looks great! Thank you for your note including the invoice. 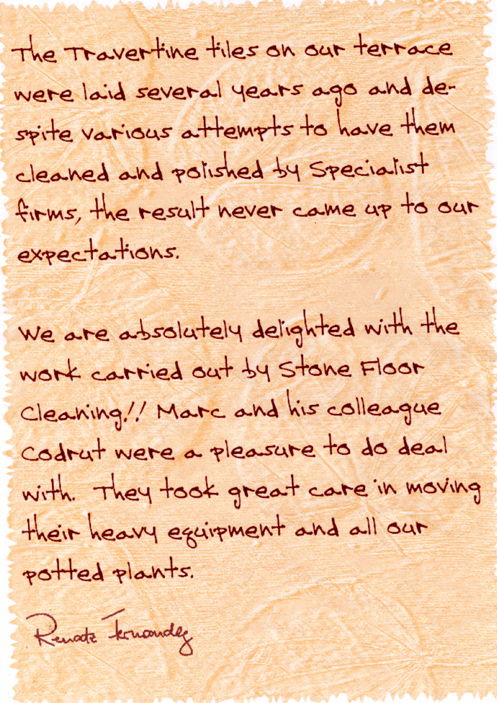 We were very pleased with the job that Marc and his colleague did and our floors look wonderful. Please thank Mark for an excellent job, our kitchen floor looks brand new. If you send me your bank details I will make an immediate bank transfer. Thank you so much for the excellent job you did on our floor – it looks great. Please also thank everyone on your team; they were professional and polite at all times and kept everywhere as clean as they could during the process as well as clearing up afterwards which made an incredible difference.